It was certainly not because the SU-24 posed any threat. The plane is old and slow, and the Russians were careful not to arm it with anti-aircraft missiles. And it wasn't because the Turks are quick on the trigger, either. Three years ago, Turkish President Recep Tayyip Erdogan emphatically declared that a "short-term violation of airspace can never be a pretext for an attack." There are even some doubts about whether the Russian plane ever crossed into Turkey's airspace at all. Indeed, the whole November 24 incident looks increasingly suspicious, and one doesn't have to be a paranoid Russian to think the takedown might have been an ambush. As retired Lt. Gen. Tom McInerney, former U.S. Air Force chief of staff, told Fox News, "This airplane was not making any maneuvers to attack the [Turkish] territory." He called the Turkish action "overly aggressive" and concluded that the incident "had to be preplanned." It certainly puzzled the Israeli military, not known for taking a casual approach to military intrusions. Israeli Defense Minister Moshe Yaalon told the press on November 29 that a Russian warplane had violated the Israeli border over the Golan Heights. "Russian planes do not intend to attack us, which is why we must not automatically react and shoot them down when an error occurs." Perhaps because, for the first time in four years, some major players are tentatively inching toward a settlement of the catastrophic Syrian civil war, and powerful forces are maneuvering to torpedo that process. If the Russians hadn't kept their cool, several nuclear-armed powers could well have found themselves in a scary faceoff, and any thoughts of ending the war would have gone a-glimmering. There are multiple actors on the Syrian stage -- and a bewildering number of crosscurrents and competing agendas that, paradoxically, make it both easier and harder to find common ground. Easier, because there is no unified position among the antagonists; harder, because trying to herd heavily armed cats is a tricky business. The Russians and the Iranians are supporting Syrian President Bashar al-Assad and fighting a host of extremist organizations ranging from al-Qaeda to the Islamic State, or ISIS. But each country has a different view of what a post-civil war Syria might look like. The Russians want a centralized and secular state with a big army. The Iranians don't think much of "secular," and they favor militias, not armies. Turkey, Saudi Arabia, Qatar, and most the other Gulf monarchies are trying to overthrow the Assad regime, and are the major supporters of the groups Russia, Iran, and Lebanon's Hezbollah are fighting. But while Turkey and Qatar want to replace Assad with the Syrian Muslim Brotherhood, Saudi Arabia might just hate the Brotherhood more than it does Assad. And while the monarchies are not overly concerned with the Kurds, Turkey is bombing them, and they're a major reason why Ankara is so deeply enmeshed in Syria. The U.S., France, and the United Kingdom are also trying to overthrow Assad, but are currently focused on fighting ISIS using the Kurds as their major allies -- specifically the Syrian Kurdish Democratic Party, an offshoot of the Turkish Kurdish Workers Party that the U.S. officially designates as "terrorist." These are the same Kurds that the Turks are bombing and who have a friendly alliance with the Russians. For instance, the Americans are unhappy with the Russians for bombing the anti-Assad Army of Conquest, a rebel alliance dominated by the Nusra Front, al-Qaeda's franchise in Syria. That would be the same al-Qaeda that brought down the World Trade Center towers and that the U.S. is currently bombing in Yemen, Somalia, and Afghanistan. In spite of all this political derangement, however, there are several developments that are pushing the sides toward some kind of peaceful settlement that doesn't involve regime change in Syria. That is exactly what the Turks and the Gulf monarchs are worried about, and a major reason why Ankara shot down that Russian plane. Hence, the Europeans have quietly shelved their demand that Assad resign as a prerequisite for a ceasefire and are leaning on the Americans to follow suit. The issue is hardly resolved, but there seems to be general agreement that Assad will at least be part of a transition government. At this point, the Russians and Iranians are insisting on an election in which Assad would be a candidate because both are wary of anything that looks like "regime change." The role Assad might play will be a sticking point, but probably not an insurmountable one. Turkey and Saudi Arabia are adamant that Assad must go, but neither of them is in the driver's seat these days. While NATO supported Turkey in the Russian plane incident, according to some of the Turkish press, many of its leading officials consider Erdogan a loose cannon. And Saudi Arabia -- whose economy has been hard hit by the worldwide fall in oil prices -- is preoccupied by its Yemen war, which is turning into a very expensive quagmire. The second development is the Russian intervention, which appears to have changed things on the ground, at least in the north, where Assad's forces were being hard pressed by the Army of Conquest. New weapons and airpower have dented a rebel offensive and resulted in some gains in the government's battle for Syria's largest city, Aleppo. The appearance of the Russians essentially killed Turkey's efforts to create a "no fly zone" on its border with Syria, a proposal that the U.S. has never been enthusiastic about. Washington's major allies, the Kurds, are strongly opposed to a no fly zone because they see it as part of Ankara's efforts to keep the Kurds from forming an autonomous region in Syria. The Bayir-Bucak area and the city of Jarabulus are also the exit point for Turkey's lucrative oil smuggling operation, apparently overseen by one of Erdogan's sons, Bilal. The Russians have embarrassed the Turks by publishing satellite photos showing miles of tanker trucks picking up oil from ISIS-controlled wells and shipping it through Turkey's southern border with Syria. "The oil controlled by the Islamic State militants enters Turkish territory on an industrial scale," Russian President Vladimir Putin said November 30. "We have every reason to believe that the decision to down our plane was guided by a desire to ensure the security of this oil's delivery routes to ports." Erdogan didn't get quite the response he wanted from NATO following the shooting down of the SU-24. While the military alliance backed Turkey's defense of its "sovereignty," NATO then called for a peaceful resolution and de-escalation of the whole matter. At a time when Europe needs a solution to the refugee crisis -- and wants to focus its firepower on the organization that killed 130 people in Paris -- NATO cannot be happy that the Turks are dragging them into a confrontation with the Russians, making the whole situation a lot more dangerous than it was before the November 24 incident. The Russians have now deployed their more modern SU-34 bombers and armed them with air-to-air missiles. The bombers will now also be escorted by SU-35 fighters. The Russians have also fielded S-300 and S-400 anti-aircraft systems, the latter with a range of 250 miles. The Russians say they're not looking for trouble, but they’re loaded for bear should it happen. Would a dustup between Turkish and Russian planes bring NATO -- and four nuclear armed nations -- into a confrontation? That possibility ought to keep people up at night. Sometime around the New Year, the countries involved in the Syrian civil war will come together in Geneva. A number of those will do their level best to derail the talks, but one hopes there are enough sane -- and desperate -- parties on hand to map out a political solution. It won't be easy, and who gets to sit at the table has yet to be decided. 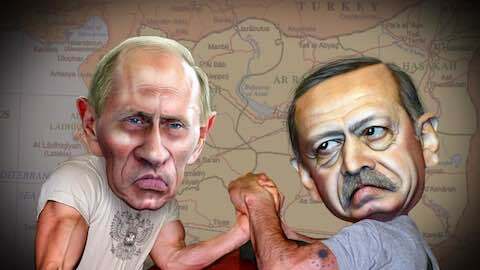 The Turks will object to the Kurds; the Russians, Iranians, and Kurds will object to the Army of Conquest; and the Saudis will object to Assad. In the end it could all come apart. It’s not hard to torpedo a peace plan in the Middle East. "So Why Did Turkey Shoot Down That Russian Plane?"